On our way north from Key West, we planned to stop briefly in Miami once more to see Hector’s mom, brother, sister, nieces and a few others before heading north. We also had made some medical appointments. And we were also planning to run some other errands including scheduling an RV repair person to work on an issue with our generator. Prior to leaving Key West, I started to have a teary, swollen eye. The day we left, my eye became really sensitive to light and painful. Also, prior to leaving Key West, Angel had been limping again, and, at the time, we attributed it to her arthritis. We arrived in Miami on Sunday. On Monday, my ophthalmologist diagnosed my eye problem as a bacterial infection and gave me some eye drops to treat it. On Tuesday morning, Hector and I noticed that Angel’s gait was worse. When Hector tried to rub her leg, she yelped. We realized that something was terribly wrong. And now with Hector’s foot, my eye and her leg, all three of us were ailing. Fortunately, we got a referral to a veterinary orthopedic surgeon and were able to get her in to see him fairly quickly. He confirmed our fear that she’d torn the ACL on her left rear leg, and recommended surgery. Apparently it’s common for dogs that have torn the ACL on one of their legs (Angel had ACL surgery on her right rear leg 1 ½ yers ago) to eventually tear the the one on the opposite leg. Of course, deciding to have your 11-year old dog undergo surgery is difficult. But we’d been fortunate enough to have found a highly qualified specialist to perform the surgery, and we decided to go forward. Happily, a week from surgery, Angel is recovering well, and all signs are positive. She is not supposed to go up or down stairs, or run or jog for eight weeks, so Hector (yes, he of the boot on the foot) has been carrying her up and down the RV steps. And she actually tries to jog when she’s outside and pulls on her leash, her appetite is back to normal, the skin on her leg looks pink and healthy and the bruising is gone. Actually, this recovery seems better than the one from her first surgery. We are very grateful to have found an experienced surgeon and are hopeful about her progress. 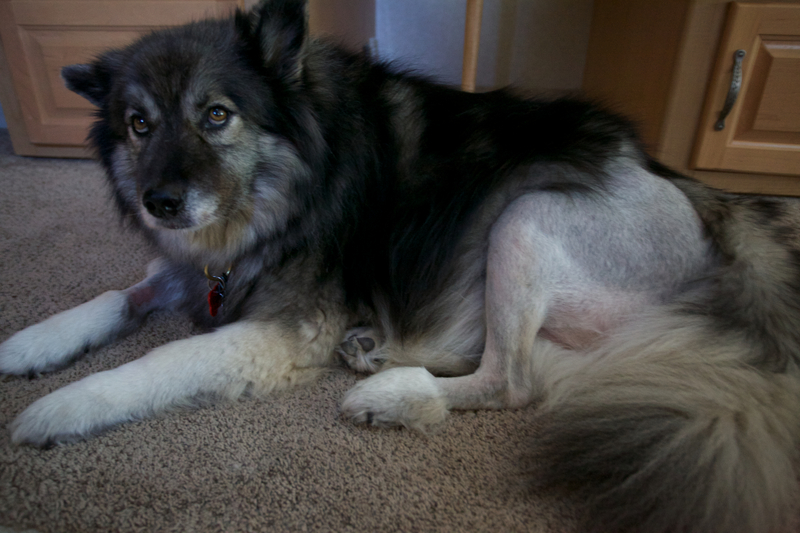 Four weeks from the surgery, we need to have her leg X-rayed as a follow-up, and we plan to do that in Atlanta. By then, we’ll have a much better idea of her prognosis. As for me, my eye was back to normal in a couple of days. Now, back to our other Miami plans. After the surgery, by taking turns staying with Angel, Hector and I were able to see many of the people we wanted to see, make all of our doctors’ appointments and get the generator fixed. It was a whirlwind week and quite stressful. We are a pretty funny looking family what with Hector’s foot and Angel’s leg. But I am thrilled to be continuing my journey with our fierce girl, Angel, and her wonderful dad. This entry was posted in Florida, RV fulltimers, States Visited by islandgirlwalkabout. Bookmark the permalink. Pobrecitos!!!! Great seeing you! Next in Canada!!!! !